The biennial matches which feature U.S. versus European women golfers tee off this morning at Rich Harvest Farms CC in Illinois. The U.S. team is defending its title, having beat Europe 15.5-12.5 in 2007. I hope the strategy Beth Daniel is employing of pairing her two best players(Kerr and Creamer) works better than it did for U.S. Ryder Cup Captain Hal Sutton who in 2004 paired Phil Mickelson and Tiger Woods together. They didn’t win a point in two matches. The match likely to draw the most spectators- The 9:50 group. Michelle Wie was a deserving Captain’s selection for the U.S. team and as long as Michelle remains interested in golf, I see her playing in many more Solheim Cup matches over the years ahead. 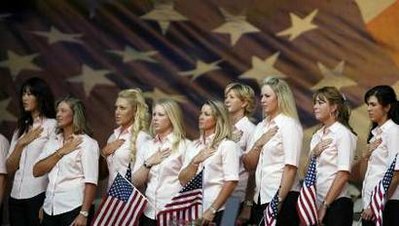 Everyone is predicting a U.S. blowout in the 2009 Solheim Cup. On paper the U.S. team looks so much stronger than Europe, and I can’t argue otherwise. All I will do is remind people of how lopsided the 2008 Ryder Cup matches looked before they were played. Europe was expected to blow out the U.S. and the reverse happened. Match play can have cause flukey results sometimes.